Manx was born in 1955 in Douglas on the Isle of Man. His family moved to Ontario, Canada, when he was six years old. He started working with bands as a "roadie" at age 15 and gradually worked his way up to becoming the regular sound man at the well-known El Mocambo (blues) club in Toronto. He left Toronto in the late 1970s, when he was 20, to return to Europe and started making money as a busker and also found work at festivals as a blues lapslide guitarist and songwriter. He then moved to Japan, where he lived and performed for 10 years. In 1990, while Manx was in Japan, he heard a recording of the Indian slide guitarist Vishwa Mohan Bhatt. When Manx met Bhatt for the first time in Rajasthan, he had been living in another part of India for years. He became a student of Bhatt's and remained with him for five years. They travelled together in India and performed for large audiences. In 2000, Manx moved back to Canada and set up residence in Saltspring Island, British Columbia and recorded his first Canadian album at the Barn Studios. This debut recording features 14 tracks of his one-man-band sound on the lap slide guitar, the Mohan Veena, the harmonica and vocals. Manx has a wife, Najma Manx, and together they have one son, Hector Oswald Manx. In a 2002 interview, in their house on Saltspring Island, Manx talked about the stresses of leaving his wife and son when on touring. “This guy here, he doesn’t care who I’m opening for,” Harry said. “He just wants me home once in a while. It gets tough sometimes. We need to keep that connection all the time. We talk on the phone every day. You should see our phone bill." Manx's musical style has been called an "essential musical link" between the East and the West. His songs are "short stories that use the essence of the blues and the depth of Indian ragas to draw you in". ^ "Press/Epk". harrymanx.com. Retrieved 2015-10-26. ^ a b c d e f g "Harry Manx biography". harrymanx.com. Retrieved 2015-10-26. ^ "Harry Manx — Free listening, videos, concerts, stats and pictures at". Last.fm. Retrieved 2015-10-26. 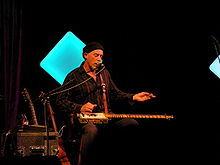 ^ a b c d "NorthernBlues Music - Harry Manx Bio". Northernblues.com. 2004-05-10. Retrieved 2015-10-26. ^ Ball, David P. (2002-08-07). "Harry Manx: A cloud ready to rain music". David P Ball. Retrieved 2015-10-26. ^ Manx's version of "Long Black Veil" is included. ^ Manx's version of "Bend in the Water" is included. ^ A compilation album of live performances from the Saturday Night Blues radio program on CBC Radio, hosted by Holger Petersen. Harry Manx's version of "Thrill Is Gone" is included. Youtube short documentary Manx describes his signature instrument; sings and play's Rueben's Train with it.